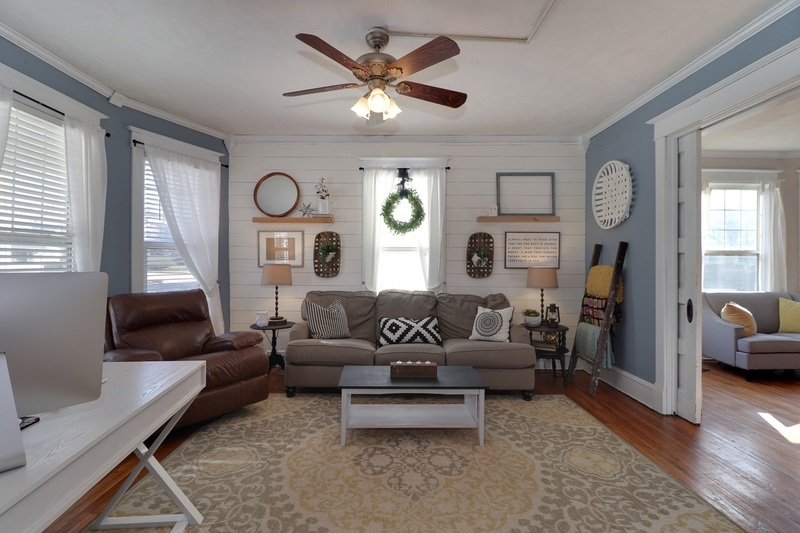 Pinterest comes to life in this adorable 3 bedroom 2.5 bath Bloomington home – Character and craftsmanship GALORE!! You won’t believe the living space inside this home with loads of updates! Start off right with adorable curb appeal – new front porch offers perfect space for rockers and a coffee table. Enjoy watching the days go by while sitting on the porch in peace. First floor features a beautiful foyer, spacious family room with shiplap walls and built-in entertainment stand, formal dining room with half bath & huge first floor laundry with lots of counter space and cabinets. Tons of windows let in natural light. Eat-in kitchen has gorgeous subway tiled backsplash. Upstairs you’ll find three bedrooms and a full bath. Hallway boasts some exposed brick and a sliding barn door! Large bedroom sizes and as a bonus, each bedroom has its own walk-in closet!!! Both full baths recently remodeled! Backyard has a newly added deck with pallet benches – makes for an perfect entertaining space. Exterior of 1309 S Madison, Bloomington IL 61701 was painted in 2016. Unfinished basement offers extra storage, 2nd full bath and more finish-able space. You won’t want to miss out on this one! Fill out our quick contact form below to request a showing! Enjoy the pictures 😀 If you’d like to see other homes we currently have for sale, click here!